Late Rally From Argentina Fails To Delay Default Earlier in the day it looked like a resolution was possible, but ultimately talks between the country and a group of creditors broke down in New York. The first time the country defaulted was in 2002. Argentina Economy Minister Axel Kicillof speaks during a news conference at the Argentina Consulate on Wednesday in New York. By the end of the day, a deal had not been reached with the country's creditors. Talks aimed at resolving Argentina's debt crisis have broken down in New York. A court-appointed mediator has declared that the country will go into default. It is the second time the country has defaulted in about 12 years. With a midnight deadline looming, the government and its creditors walked away without a deal late Wednesday. Argentina has been waging a protracted legal battle with a small number of bondholders. They want to be paid in full for bonds they purchased years ago. "It looked early in the day as though there might be a resolution to this dispute," NPR's Jim Zarroli said on All Things Considered. "We heard that the two sides had actually met face to face yesterday for the first time." By the afternoon, the rating agency Standard & Poor's said it was placing Argentina in "selective default," which, Zarroli explains, "means it's paid some of its debts but not all of them." After several hours at the mediator's Manhattan office, there was no resolution, Zarroli tells NPR's Audie Cornish. Mediator Daniel Pollack declared that "the Republic of Argentina will imminently be in default." 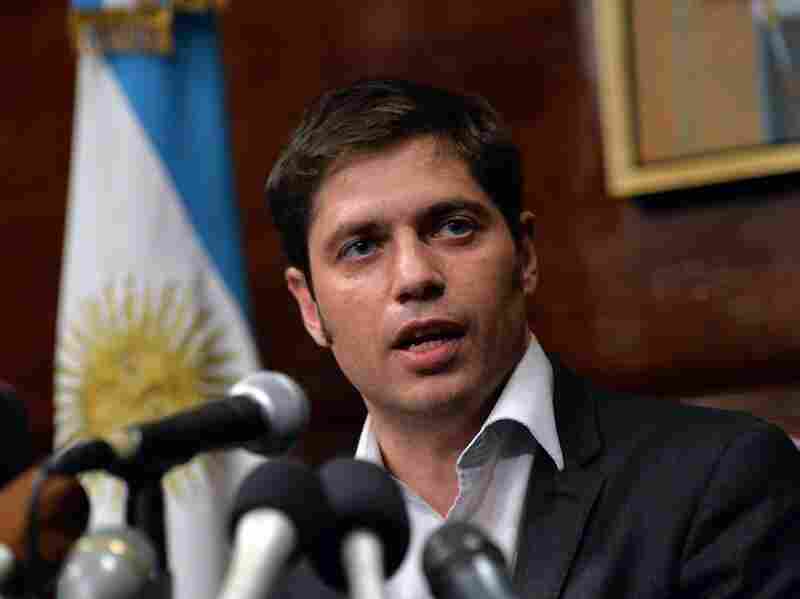 Argentina's economy minister, Axel Kicillof, told reporters after the meeting that Argentina had made an offer that was rejected. "Argentina defaulted for the first time back in 2002, and it was able to get a lot of bondholders to take less money than they were owed," Zarroli says. "But there were these holdouts who were demanding to be paid everything they were owed, and they're the ones Argentina's been fighting with. "Kicillof said, as he has before many times, the country cannot legally pay 100 percent of what it owes to one group of bondholders without paying the others the same thing; it can't afford it." Mediator Pollack said today that the "consequences of the default are not predictable, but they are certainly not positive." Argentina has already been having economic problems, Zarroli reports; "this is going to compound them. "It's been frozen out of the debt market since the 2002 default, and it's likely to stay that way," he says. "It's also going to have a big impact on the value of Argentina's currency. It's going to push interest rates higher for businesses. And of course, it will hurt a lot of those individual bondholders." There were institutional investors, like hedge funds and pension funds, which bought the bonds at a discount after the first default, Zarroli says. But there were individual investors, too. "Some of them retirees who bought the bonds because the interest rates were very high; a lot of Italian pensioners were in the group," he says. "Many of these people took a big hit after the first default. They were required to accept less money than they thought they were getting, and now they're going to get even less than that. "So a lot of people are hurt by this," he adds, "but the real impact should play out, I think, over the next few days."